These ten essentials for a successful succulent front yard aren’t difficult to achieve yet make a big difference. 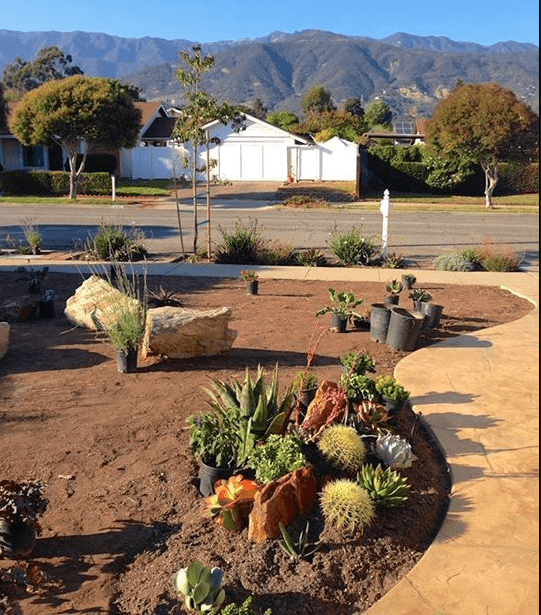 We have designer Deana Rae McMillion to thank for chronicling and sharing her lawn-to-succulents transformation, not only after installation, but also over the ensuing three years. It looked great immediately, earned a city beautification award, and—as you’ll see—continued to improve. Deana Rae credits San Diego designer Laura Eubanks for inspiration. BEFORE The McMillions 1970s house and yard, viewed from the street, was all lines and rectangles lacking interest and personality. The location is Carpinteria, CA, south of Santa Barbara, a mile inland from the ocean. 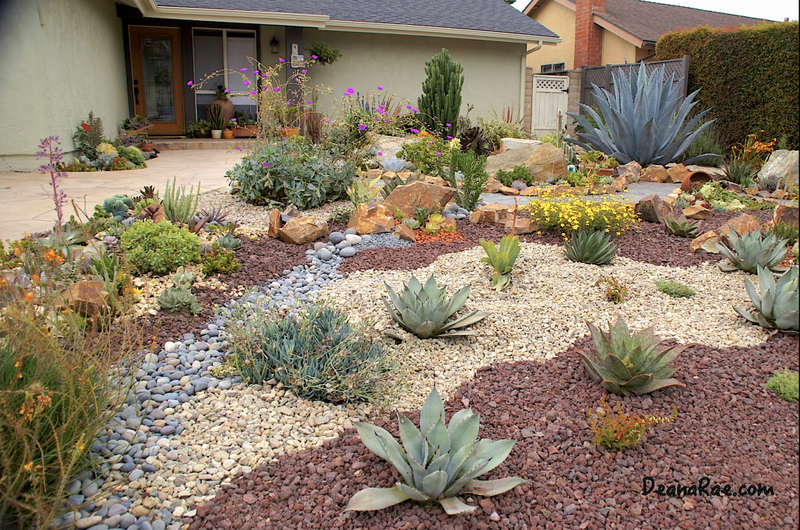 In 2012, a year after she and her husband moved in, Deana Rae cut out a small area of the lawn and experimented with succulents. They did well, and an Agave americana quickly attained several feet in height and diameter. Notice how it (the big blue century plant at upper right) has grown over time and serves as a dramatic focal point that visually balances the “weight” of the house. After the sod was cut and removed, Deana Rae installed pocket gardens alongside the new front walkway. #2: Ask friends and neighbors for succulent cuttings. If you’re not going to put them in the ground right away, start them in pots. #3: If soil is compacted and difficult to dig, give succulent roots a fighting chance by spading it and adding amendments prior to planting. #4: To add interest and definition to the overall design, bring in large boulders. They weigh tons, so have them delivered and positioned BEFORE you plant. #5: Don’t skip the infrastructure. Take care of pre-planting steps like installing and adjusting irrigation, evaluating runoff, repairing drains and walls, and upgrading hardscape. #6: Design with undulating lines for a natural look. Straight lines and rows are more formal, seldom found in nature, and emphasize the linearity of nearby structures. #7: In close-up areas, create complex plantings. Viewpoints that are broader and farther away need less detail and larger plants. 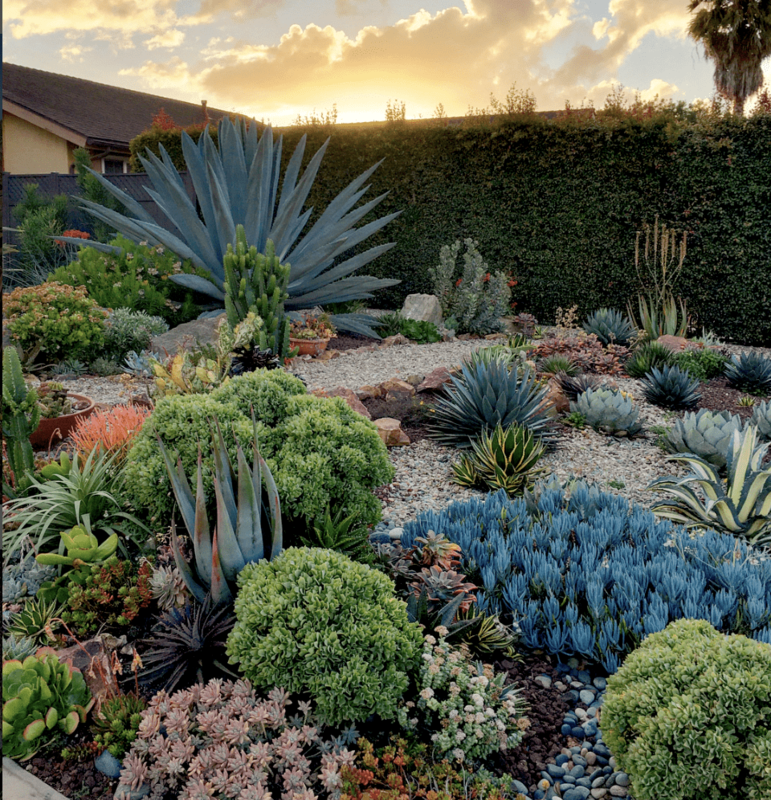 Deana Rae’s plant choices include medium-sized agaves, aloes, calandrinia (with purple flowers), bulbine (orange flowers), blue Senecio mandraliscae, and drought-tolerant perennials such as yellow sundrops (Calylophus sp.). A dry creek bed of river cobbles funnels rainwater into the garden. Small succulents such as jades, aeoniums, echeverias and sedums—all from cuttings—nestle around boulders. Aloe maculata (in bloom) is tough and its offsets are often free for the asking. It’s one of the few succulents that’s invasive in friable soil, but in a parkway strip like this, it can’t get into trouble. In fact, as it spreads, it’ll make the the area look even better. The fortnight lily at right was well established, so it stayed. #9: Continue rocks and gravel into the parkway strip. This enhances the overall design, makes the front yard larger, and makes what’s sometimes called a “hell strip” easy to maintain. Lance-leaved Agave lophantha ‘Quadricolor’ (center) contrasts with curvier plants: ripple jade (upper right), Euphorbia mammilaris (lower middle) and a crested myrtillocactus (center left). Echoing the agave’s pointed rosette are Echeveria subrigida ‘Fire and Ice’ (lower right, in bloom), Echeveria agavoides ‘Lipstick’ at lower left, and aloes. Rivulets of gravel flowing through the garden suggest motion and water. They also contrast and repeat colors of succulents, and provide access to planted areas. Statuesque Euphorbia trigona ‘Rubra’ serves as a focal point that will triple in size over time. An eclectic mix of small succulents includes echeverias, aloes, kalanchoes, sedums, crassulas and barrel cactus. A low-water salvia in bloom (upper left) lends floral color and a mounding, soft-textured backdrop. A ceramic turtle adds a touch of whimsy and repeats the color and shape of a cluster of turquoise echeverias. It’s fine to add a planted pot to a garden, like the wide terracotta bowl at left (with Crassula ‘Mini Jade’, Kalanchoe luciae and Portulacaria afra ‘Variegata’). Lampranthus deltoides at upper left extends the blue and lends frothy texture. Aeoniums, sedums and aloes complete the composition. A sheltered niche amid rocks is a great spot for echeverias, which can be tricky to grow in the open garden and generally do best in pots. Amid them are Sedum ‘Blue Spruce’, silver squill (Ledebouria socialis), and orangy-red Crassula ‘Campfire’. Follow Deana Rae McMillion on Instagram @deanaraedesigns.